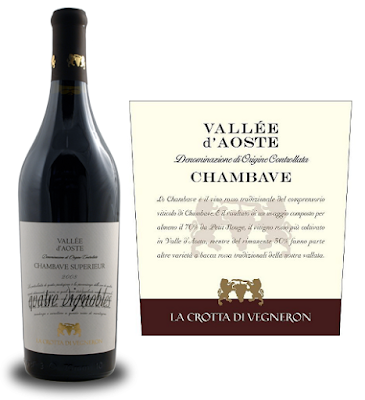 The Vallee d'Aoste Chambave rouge is a dry wine, fruity and harmonious, produced primarily from the grapes of Petit Rouge (minimun 70 %, according to the specification) to which are added the grapes of Dolcetto, Gamay e Pinot Noir, coming from the vineyards of Chambave, Saint -Vincent, Pontey, Saint-Denis, Verrayes and Chatillon. It has a good alchool content (11,5°-13°), a ruby red color with violet hues and intense and persistent perfume, with hints of flowers and fruits. The Chambave Doc is one of the excellent italian DOC wine in which you can find all the pleasure and taste of the Valle d'Aosta red wines. It embodies all the characteristics of the red aostan wines. This red that can be used as a dinner wine, especially with local meats, soups and stews. A suggestion: it is a wonderful combination with the typical "carbonada", a recipe made with beef stew. A holiday in the Valle d'Aosta can be an opportunity to discover the secrets and specialties of this region along the road of wines of Valle d'Aosta, recommended for all curious travellers. If you want to come in Italy to taste these precious wines, just send a simple request to our partner travel portal Leibtour.com.